I’ve been a bit out of sorts recently, getting a little buried under things that are less-fun than cooking and baking. Fortunately, I gotta eat. And I also have to have chocolate, frequently. (As in, daily.) Otherwise I turn into some kind of crazed person. It’s a little strange, but I guess there are odder things to be addicted to. But if I don’t have a tablet of chocolate in my kitchen (or living room, or bed room, or…), I go a little mental and find myself wandering around wherever I am, searching for a bar to break the end off of and nibble on. Which is why unsweetened chocolate is so vexing. 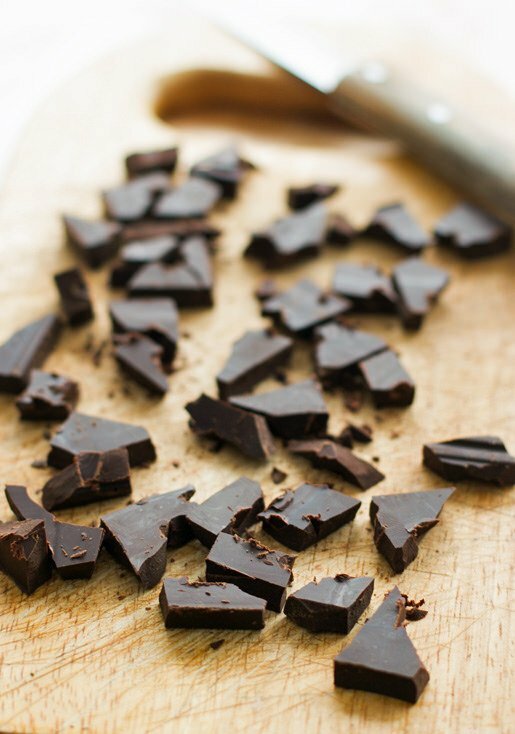 While it’s great for baking, and giving things like chocolate pudding an especially intense bitter chocolate flavor, it’s hard to keep my hands off the little chunks when I can chopping it up for a recipe. 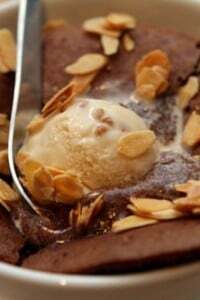 In spite of the fact that Americans are known for our love of sweets, we tend to bake with unsweetened chocolate, which is available in any supermarket, often called “baking chocolate.” And it’s an essential ingredient in classic American brownies. I’m in New York City for a spell, working a bit here and there and getting started on a new project, working with my editor who I’m hoping will hold my nose to the grindstone and keep me undistracted from things like stocking up on bars of chocolate and make sure that I am firmly in place in front of my computer (and in front of my stove), so I can focus on something other than making sure that I’ve got plenty of chocolate on hand. But with unsweetened chocolate so readily available, why not do my part and put some of it to good use? We’ve also had to get used to “kale clog,” those blockages of bits of kale in the kitchen drain that need to be constantly cleaned out. And because America seems to be the land of innovation – or, depending on how you feel, the land of excess – I’m surprised that someone hasn’t come out with a special tool for removing those stubborn pieces of kale from drain holes. 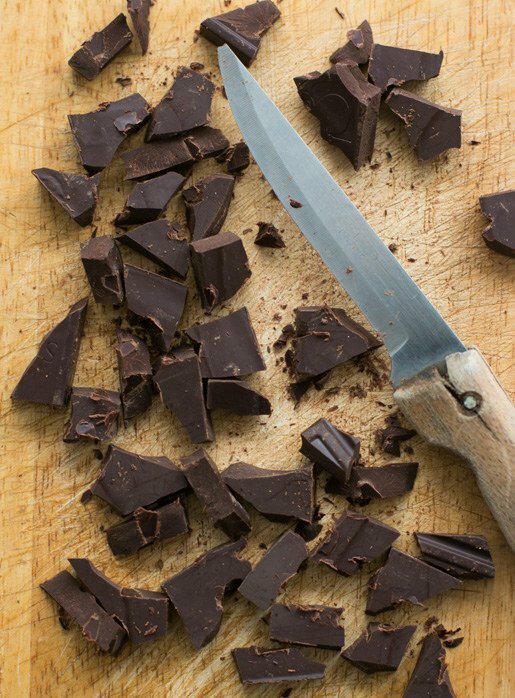 Fortunately chocolate doesn’t require any special tools to use, just a knife and cutting board. 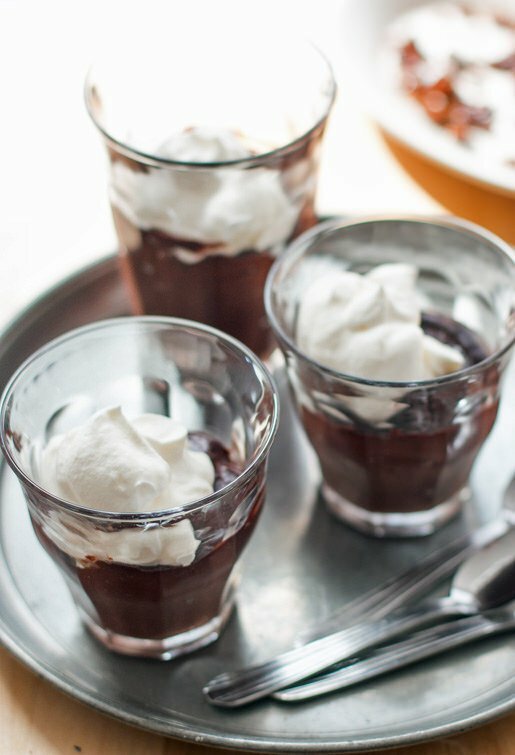 And while the French have mousse au chocolat, Americans have our chocolate pudding — dense, creamy custard, thickened on the stovetop, then poured into glasses and chilled. I decided to ramp up the chocolate flavor of this chocolate pudding with cocoa powder, because if you’re going to eat chocolate, you don’t want something wimpy. You want a full-on, direct, hard-core, chocolate experience. At least I do. And to top it off, I made a crackly brittle with roasted cocoa nibs, which are ground up bits of cocoa beans. Cocoa nibs were practically unknown a decade ago. But now, I see them sold in well-stocked supermarkets in America, and they’re terrific mixed into brownie and cookie batters. They also provide a nut-like, chocolatey crunch to the brittle, which I crumble over the puddings, after topping each with a dollop of softly whipped cream. In the United States, unsweetened chocolate is often called “bitter chocolate” (not bittersweet chocolate) or “baking chocolate.” In France, it’s called pâte de cacao, or cocoa paste, sometimes with a “99%” or “100%” notation before it. (Lindt makes a bar, which is available internationally. Otherwise check professional baking supply shops. In Paris, they stock it in bulk at G. Detou.) If unsure, check the list of ingredients. Unsweetened chocolate will not have any sugar in the list of ingredients.Cocoa nibs are available in well-stocked supermarkets, specialty food shops, and online. If you can’t get them, or would prefer, you could use an equal amount of lightly toasted, chopped nuts, in place of them for the cocoa nib brittle. If you’ve not made caramel before, you may wish to review my post, How to Make the Perfect Caramel, which includes step-by-step pictures. 1. To make the double chocolate pudding, in a medium saucepan, whisk together the cocoa powder, 3/4 cup plus 2 tablespoons of sugar, corn starch, and salt. 2. Gradually whisk in 1 cup (250ml) of the milk, stirring until it’s lump-free. Mix in the rest of the milk, as well as the egg yolks and cook the mixture over moderate heat, stirring constantly with the whisk, until the mixture starts to boil and thickens enough to coat the back of a spoon. 3. Once it starts to thicken, reduce the heat if necessary to keep the mixture at a very low boil, stirring constantly with the whisk or a heatproof spatula until the pudding is thick and holds its shape, about 2 minutes. Remove from heat and scatter the chocolate over the top. Stir the chocolate in with a heatproof spatula, along with the vanilla, until the chocolate is fully melted and the mixture is smooth. 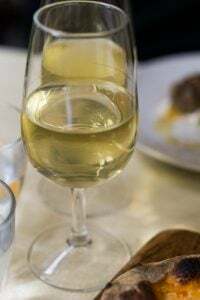 If the mixture seems lumpy before you scrape it into the glasses, give it a couple of brisk stirs with a whisk, or press it through a mesh strainer to smooth it out. 5. 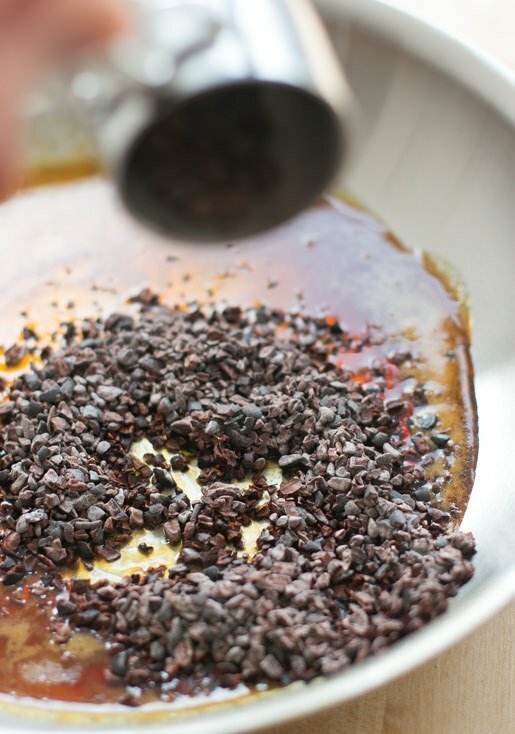 To make the cocoa nib brittle, lightly oil a 12-inch (30cm) area on a baking sheet. Set aside. 6. Spread the 1/4 cup of sugar in a skillet, in an even layer. Heat over medium heat until the edges liquify, then begin to turn an amber color. 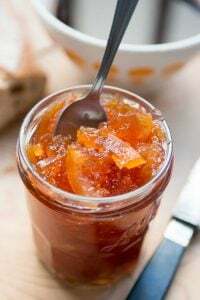 Using a heatproof spatula, or other utensil, gently stir the liquified sugar in toward the center, stirring the mixture as gently as possible until the liquified sugar is a dark amber color and just begins to smoke. 7. 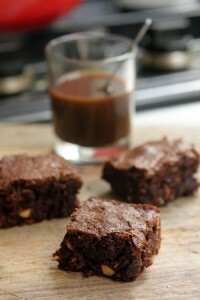 Remove from heat and immediately stir in the cocoa nibs, just enough to that they are coated with the caramel. Scrape them onto the oiled part of the prepared baking sheet and spread as best you can, before it hardens. (If it gets too cool in the pan, you can rewarm the caramel with the nibs slightly over low heat, to make it spreadable.) Let the brittle harden at room temperature. When cool, crumble into little bits. Serving: Serve the pudding with a dollop of lightly sweetened whipped cream, with crumbled brittle over the top. Storage: The puddings will keep for up to four days in the refrigerator. The brittle can be made up to two weeks in advance and kept in an airtight container at room temperature. It can also be frozen, if well wrapped, for up to two months. Today is my 40th wedding anniversary and now I have the perfect dessert recipe for my chocolate loving sweetie. Thanks! My French boyfriend also discovered the Whole Foods salad bar on a recent trip back to the U.S…maybe Whole Foods will be Paris’ new Marks & Spencer in the years to come? 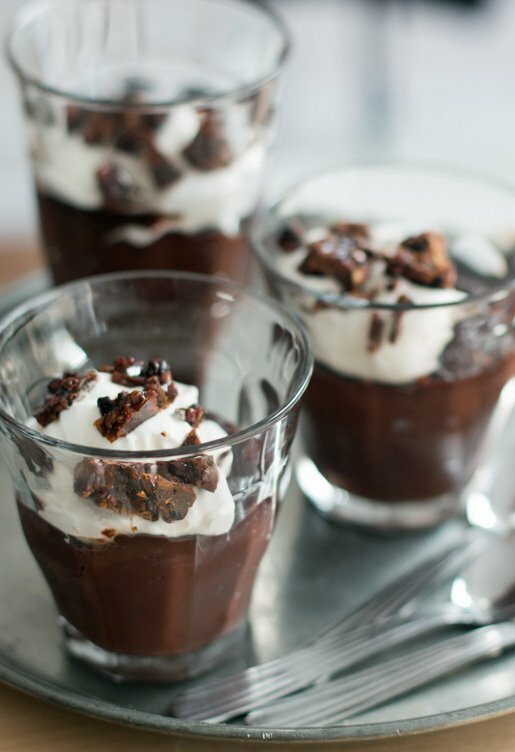 And chocolate doesn’t get much better than in pudding form…saving this recipe! There has been some speculation about Whole Foods in Paris but I think the idea of a “serve yourself” (or “help yourself”) salad bar might be a bit of a challenge for people…and for the store! Genious to caremelize the cacao nibs! I can imagine how it takes their slight grittiness away and how well-balanced the tastes must be. I just did the math and realized that I have chocolate stashed in four separate locations in my home, only one of which is in the kitchen. Seems perfectly reasonable to me! i like the idea of caramelizing the cocoa nibs too. I could really go for some caramelized hazelnut on top as well. Who says pudding can’t be fancy?! 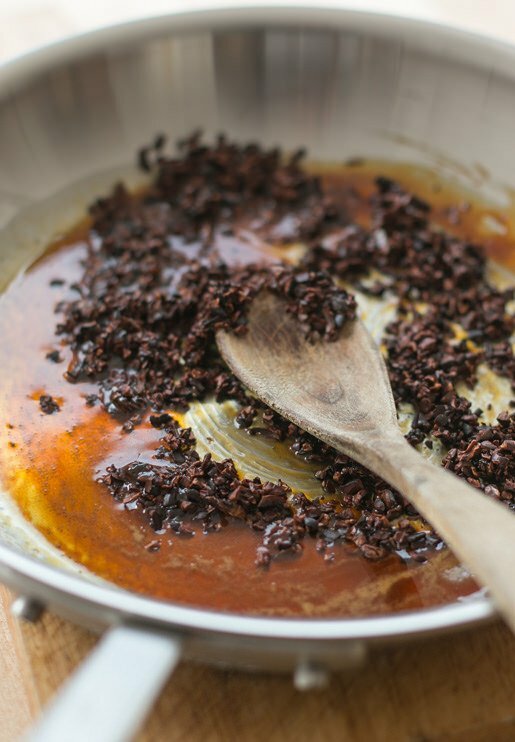 I adore cacao nibs – how have I never thought about caramelising them before?! Do you think there is a gene for chocolate-necessity? I know I have it – I even hide my chocolate from my husband – have to have my daily dose and it must be good quality not-very-sweet chocolate. I think I have about 30 bars hidden downstairs. Do you think there is a squirrel gene that goes along with the chocolate one? When I saw it in my bloglovin feed I already new this the type of dessert that I will love. I love chocolate .. Very delicious. There is nothing like unsweetened (bitter!) chocolate for intense chocolate flavor. It is tricky to melt. Still best done in a small bowl set over boiling water, but with heat off. Too much heat will ruin it. I learned to bake with it. Cocoa powder was too wimpy for my late Mother, who was a genius baker. For the person who needs a chocolate fix, it is hard to beat the Pound Plus bars at Trader Joe’s. My favorite is the darkest (72%?) – out of it as of yesterday or I’d check package to be sure. It is scored in 1″ blocks. One or two of those in the afternoon? Better (and cheaper) than a shrink! I’ve been on a chocolate pudding tear this winter, although I’m not sure I can be this ambitious. 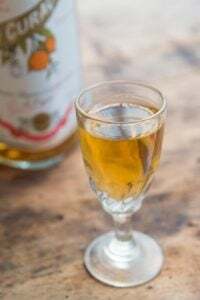 I love that you are using Picardie tumblers–what a good idea! I happen to have a partial bag of nibs left after making the Tunnel of Fudge cake using the nibs in place of the nuts called for to make the fudge like center. I now have a great use for them. I now have a cooking project for today. I thank you very much. Sounds great, and perfect for being housebound in the New England snow right now! As a fellow chocolate addict, might I also invite you to try one of my favorites, chocolate tapioca pudding? I simply add good cocoa to the sugar mixture before bringing it to a boil. (You can work out your own.) Also, one of the odd fortunes of living where I do is access to the Sid Wainer Outlet store in New Bedford MA, where there are things not seen in any of the high end grocery or specialty stores since the company caters to high-end chefs. And the bulk / chunk chocolate they sell for about $9/lb. of Callebaut. (Good cocoa also available there in bulk.) Otherwise, I agree with the previous comment about Trader Joe’s bulk bars of chocolate — a super product at a great price. And now I am craving chocolate and itching to go buy coca nibs from the grocery store! Those caramelized cocoa nibs sound delicious! Such a neat idea. Plus, this pudding is pretty spectacular on its own! Whimper … don’t they do Lent in Paris? I do wish someone would explain to me what is meant by “Dutch Process cocoa”, and what the alternatives might be. Here in the UK, you can buy cocoa powder made by Cadbury’s, or a supermarket own brand which is probably also made by Cadbury’s, and that is all. I have absolutely no idea what sort of cocoa it is, and thus am reluctant to try any of your delicious recipes in case it is the wrong kind and I have a disaster. 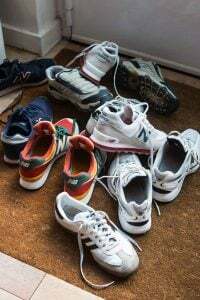 Dear Mr. L: I’m addicted to your blog! Just made your Meyer lemon curd over the weekend and the guests swooned when they tasted it. Question: what else can I make with the black cocoa powder I ordered to make your deep, dark brownies with sea salt (also incredible)? Black cocoa can be swapped out for some of the regular cocoa powder in most recipes (I’d swap up to half, for example is you’re recipe calls for 1/4 cup of cocoa powder, use up to 2 tablespoons of black cocoa powder in place of the cocoa powder.) It has a pretty aggressive flavor! From the.. well, David’s mouth anyway – a great explanation. FYI…About the clogged drain…Tweezers (I keep a kitchen tweezer in my junk drawer for just that purpose) Also, hardware stores in the US have these 18″ long claw style flexible grabbers that have a spring loaded button (for lack of a better description) at the top which opens the claw at the bottom when you press it so that you can grab the item that is stuck in your drain (it’s good in tub or shower drains that get gooped up with hair, too) Also, I use a sink drain strainer. It’s made with a screen material (like window screen) that fits inside the kitchen sink drain with an aluminum rim that fits around the top. It catches all kinds of little stuff that normally would just go down the drain (like oatmeal, cocoa nibs(! ), seeds..etc), but in the long run, it has really cut down on the gunk that gets trapped in the other drain-goo so makes fewer the number of times I’ve had to use that Liquid Plumber stuff to unclog the drains…think Thanksgiving and Christmas drain debacles! I imagine hardware stores also sell them, but I got mine at Big Lots for about $2. and I always see them there. They even have them for bathroom sink drains, sometimes. I keep one in my bath sinks, too. I have a big pack of cocoa nibs in my cabinet that are waiting to be used! Can’t wait to try this. I will taste this over de weekend.Delicious! 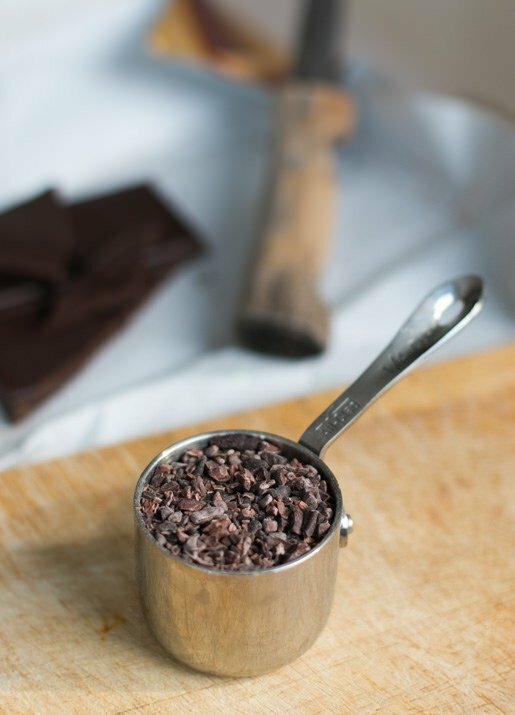 Cocoa nibs, love that…and on top of chocolate pudding, sounds divine! Will try it w/Trader Joe’s dark chocolate (72% cacao). You only live once. No nibs on hand, but the pudding is made and chilling in the fridge as I type. Nothing covering it. I LOVE pudding skin! And the warm pudding licked off the spatula wasn’t too shabby either. I left sufficient pudding behind in the pan to test. Quality control and all that. I shared a Trader Joe’s dark chocolate bar with a coworker today. She thought I was crazy because I have a stash of those in my purse, but I thought she was crazy because she didn’t. Loving this recipe! It’s going onto a recipe card for my hard copy box. The first time I used cocoa nibs it was in your chocolate ice cream recipe. I can’t even imagine what becomes of that item if I use carmelized nibs. OMG! This sounds wonderful, and I’d like to try making it! I’ll have to leave out the cornstarch though (allergy problem). Any substitution ideas? Tapioca starch? Arrowroot? Other? I think you could try potato starch in place of the corn starch. I’ve not used arrowroot or tapioca starch, but generally I think they behave the same way as well. I wouldn’t recommend tapioca starch. I realized I was out of cornstarch once after I’d started to make pudding and subbed in tapioca starch instead. The resulting texture was unfortunately chocolate snot. You know I never used to be into chocolate that much, I could pretty much take it of leave it really and I’m still not a huge eater of it. However a really good, bitter dark chocolate is something else entirely. I’ve used it in ragu and stews before, giving it a whole new depth (as I’m sure you well know David). 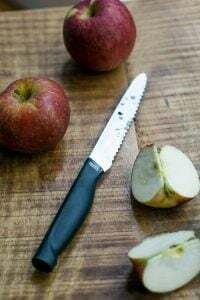 Great recipe and one I have bookmarked for when I need to get in the good books of my better half! Normally I read your posts without commenting but caramelized cocoa nibs? Just had to say how epic they sound (as does this rich, dark pudding). Yum. Cheers to chocolate every day. It makes for a much better life. Oh David, this sounds perfect! Good news for Chuck. The ban on garbage disposal units in New York City was lifted in 1997. It seems that many buildings still ban them do to ancient plumbing, but they are now offered as an amenity in many buildings. As long as I had to come back, I’ll mention a ditto for the suggestion up the thread about the gadget that fits in the drain opening and keeps bits of stuff from going down an open drain. These wonderful things, made like a regular round strainer with a metal rim, that cleverly fit down into the sink drain, are dirt cheap and worth a mint. David, on an unrelated topic, had dinners at Cafe Dubonet and Pottoka the past few nights. Fantastic! Thanks for the reviews and recommendations. Enjoy New York in the winter! I work at a “Norwegian ” style foodcart in portland, oregon (Viking Soul Food), where we keep a disposable plastic fork to clean out the drains of the kale bits. Thanks alot for your posts, I enjoy reading every one of them. David ~ how decadent. Yum. As to your crankiness…. maybe you yearn to be back in Paris! Yes, I’ll be doing a few events. They’re listed on my Schedule page. And the best part about it. It goes well with my LCHF way of life. I just use sweetener instead of sugar. Thank you, dear David, for all the good articles, reviews and beeing here for us (me) for the last couple of years. You helped (kind of) to get over my anorexia problem. BIG BIG THANK YOU and a HUG from the small country of Slowenia! 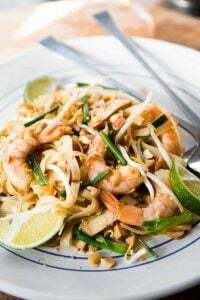 I made this the day you put the post up and I just have to say it was delicious and deliciously simple! Such a great alternative when you want a mousse-like dessert (I often crave mousse!) but in a hurry. Great recipe thanks! I too, seem to need chocolate everyday. I just purchased my first bag of cocoa nibs and was looking for inspiration, this pudding looks marvelous! Your chocolate pudding recipe with the caramelized cocoa nibs sent me racing out to the kitchen for a spoonful (or ten) of your chocolate sorbet, which is always available in my freezer. Always. I add some of those Valrhona Les Perles Croquantes Dulcey, sometimes one of Valrhona’s other croquante varieties just before the churning finishes. Sorry, know this is supposed to be about the pudding, but that sorbet! Now I’m afraid I might become addicted to your pudding with the nibs as well. Am going to make it tomorrow morning, maybe at dawn. Made your pudding yesterday and it is really top notch! I didn’t have cocoa nibs though so next time I make it I will be sure to do the caramel crunch with them…I’m also enamored of the low fat content of this pudding compared to the one I usually make. Flavor is first to me always but this is a win-win! I made your lemon curd, and subsequently lemon tart last week and this week your chocolate pudding is currently chilling in the fridge. Pausing in the prep of the whipped cream to stop by and say “thanks” for another go to recipe. Enjoy your time in the US, hoping to catch you while you’re in SF. How exciting you are coming to Charlottesville! I am sure your hosts have great restaurants lined up for you, but I thought I’d add my favorite food shops you might enjoy. 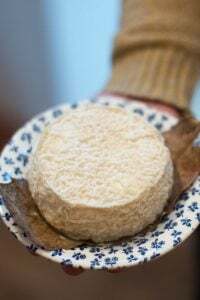 Main Steet Market – especially The Spice Diva, Feast, and the Organic Butcher; the canele at Maris Bette bakery; Greenwood Gourmet Grocery in Crozet – their pastry chef keeps getting mentioned and her pie crust is out of this world. 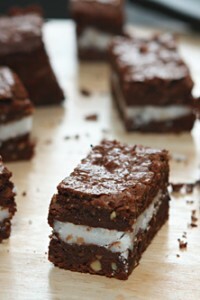 Gave up desserts for Lent, reading this recipe was torture. 30 more days to go! This will be the first dessert I make. Thanks to you David, I recently made a pilgrimage to Dandelion Chocolates in SF and purchased cacao pods (the nibs are inside for those uninitiated)! So I just made your Cocoa Nib Brittle and it was outstanding, and gone before I could garnish the pudding (which was great, but paled in comparison to the nibs)! So simple to make. The nib brittle will become a standard sugar/choco/caffeine buzz for me! Thank you! Absolutely decadent and that’s the perfect dessert for a chocolohic like me : ) I’m obsessed with these caramelized brownies now! Fantastic recipe! Doubled it for a dinner party this weekend since the guest-of-honor doesn’t eat gluten and everyone swooned. I put the pudding through a fine mesh strainer to smooth it out. I really appreciate your excellent instructions on how to make perfect caramel. I had never caramelized sugar using the “dry” method before and your photos and instructions made it easy. The hard part was getting the chocolate nib brittle spread out in a thin layer. I’m inspired to try sesame seed toffee next. Thanks for a great gluten-free dessert! I tried making the brittle more liquid, and easier-to-spread, by adding more water but found that it was a little harder to chew through, so kept the proportions of nibs to sugar as published. One could warm the cocoa nibs and add them to the caramels, which would help it spread, but I found it not necessary and the brittle was tasty as is. You are torturing me with all that chocolate David. I love the crack of a good quality dark chocolate. Oh and I am very used to kale clog, as I have green smoothies most days. I just didn’t have a name for it up until now. David, thank you!!! For all of you on this blog. It helped, when i was down and battled with my problems. !!!! This recipe is wonderful. I’ve been trying to lighten things up as the sun remembers that New York is still on this planet… used reduced fat milk… never the less it was (is) just so deeply chocolatey. Great recipe, I look forward to making it. What a genius idea with the cocoa nibs. Can you tell me what cocoa nibs are called in French and where I am likely to find them please? They’re called grué de cacao and I get mine at G. Detou. I just made the caramelized nibs to add to oatmeal cookies, since I’ve often made chocolate toffee for that purpose and loved the idea of toffee nibs. But, while yummy, I’m thinking I might enjoy them more with butter (like most things, right?). Any reason you can think of why I wouldn’t want to add a few tbs of butter to the caramelized sugar before adding the nibs? I figure it’d be somewhat like making the toffee in this recipe (http://smittenkitchen.com/blog/2009/12/coffee-toffee/), but then adding the nibs before spreading out to cool, with or without chocolate on top. Thanks for the fun idea, either way! That kind of toffee is similar to my chocolate-almond buttercrunch – which is pretty different. (It has baking soda in it, and a lot of butter, which creates that “toffee” structure.”) I’ve not tried adding butter to brittle like this, but if you do try it, let us know how it turns out. Thank you for responding to my request for a translation of cocoa nibs and leading me to your article on G. Detou. What a marvelous shop, worth a trip to Paris alone. I wonder if there’s one like it in Toulouse? Still a good hour’s drive from me. Made it last night, without the nibs. Fantastic! Scraped the warm pot clean – tasted like the inside of a warm chocolate soufflé. Today, the cold pudding tastes somewhere between a pudding and a mousse.